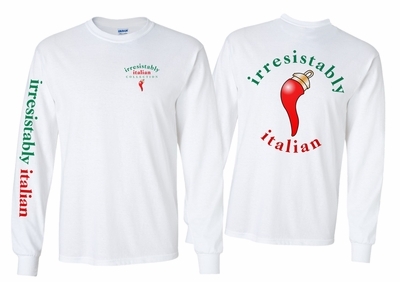 Irresistably Italian Long Sleeve T-Shirt! Be a part of the Irresistably Italian Team with our latest arrival from the Irresistably Italian Collection. Irresistably Italian printed in Green & Red on the sleeve and the Italian horn printed in beautiful red & gold on the left chest and back. Remember� you found the Irresistably Italian Long Sleeve T-Shirt at TShirtHub.com, where high quality came at a low price.